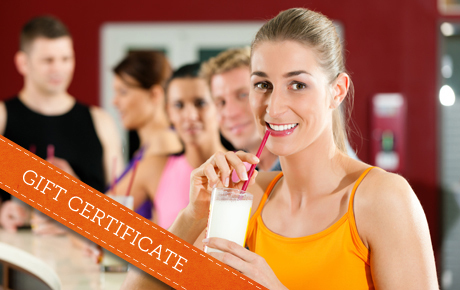 Hide deals from seller "E-Z Nutrition"
Hide deals from category "Juice Bars & Smoothies"
Treat your body right with 50% off a $20 Gift Certificate to E-Z Nutrition in Mount Prospect. This health and fitness shop offers nutritious drinks as well as nutritional advice and fitness camps. E-Z Nutrition's mission is to bring wholesome nutrition and guidance to members of the community. The staff informs people about the importance of proper nutrition and exercise, and it offers ways to help people achieve their fitness goals. E-Z Nutrition also features a delightful array of smoothies, teas and aloe shots for refreshment with nutritional value. Indulge with smoothie flavors like chocolate mint, strawberry cheesecake and ice cream sandwich. You can also sign up for weight loss challenges and bootcamps at this comprehensive and friendly health store. A nutrition club in Mount Prospect that promotes a healthy diet and offers a variety of smoothie combinations.